At the end of World War II in 1945, Heinrich Spaatz (Pleasence) vows revenge on evil Nazi doctor Wolfgang Manteuffel (Vaughn). Twenty years later, in 1965, we’re introduced to “adventurer” John Hamilton (Dudikoff), a guy who knows the Amazon river like the back of his hand and gives tours through the dangerous jungles. In his latest tour group are people that want to find out the origins of a mysterious disease that’s been ravaging the local population, as well as some Nazi hunters that believe Manteuffel is hiding out in the area. All want to find the legendary “Lost City” which should hold the key to pretty much everything. But along the way, they’re going to have to face many pitfalls and challenges - everything from “river pirates” to the unknown jungle disease. Will they succeed? I guess Firewalker (1986) wasn’t enough of an overlong jungle slog for Cannon, so they decided to make another one a few years later. Why they thought audiences had such an appetite for jungle slogs is unknown, but here’s another one. Take the aforementioned Firewalker, add some Golden Needles (1974), and maybe some Skeleton Coast (1988), and you have a plot you’ve seen many times before. If you really want to see a quest for the lost city, see Quest For The Lost City (1990). Sure, River of Death might be based on a story by the acclaimed Alistair MacLean, but it lacks a Zap Rowsdower. Or even a Mike Pipper. So can it really compete? Dudikoff is as cool as ever, and his gruff narration adds...something...but honestly this isn’t really an action movie, it’s more of an old-fashioned “adventure” movie. Why the filmmakers thought that would be better, we don’t know. It seems like a bit of a cop-out. Dudikoff doesn’t even do any Martial Arts. Due to the length of the movie, and the quality cast, we presume Cannon was going for some very mainstream material. What they came out with is pretty boring, because there isn’t really any character development, so you don’t really care what goes on, and even what little bit of gunplay and explosions there happen to be don’t help things. Robert Vaughn - yes, Control 5 himself! - is on hand as a Nazi. We always love seeing him, and he clearly is enjoying himself here, probably because he doesn’t get too many Nazi roles. Maybe there’s a reason for that? Perhaps the good lawyers at Mark E. Salomone and Morelli liked what they saw and decided to give the poor guy a break. We kid Vaughn because we love. We’re also big fans of Donald Pleasence, and he gets to do a lot more here than, say, in the entertaining (but largely Pleasence-less) American Tiger (1990). Herbert Lom is also onboard with the cast of older gentlemen, which adds to the Skeleton Coast vibe. Too bad they couldn’t get Borgnine. The bottom line here is that this movie should have been snappier, with a more vibrant pace and about a half an hour chopped out of the running time. We see what the filmmakers were trying to do, but it’s all so bloated. Director Steve Carver, who only a year previously directed the fun Bulletproof (1988), should have taken a page out of his own handbook and livened things up a bit like he did with that Gary Busey vehicle. He truly shouldn’t have been such a “Butthorn”. We’ve seen a lot worse, and this movie is fine for Dudikoff completists or even Pleasence fans, but casual viewers will probably be turned off by River of Death’s sluggish ways. Your Mark E. Salamone and Morelli reference absolutely killed me. Every time I catch BASEketball, I think that somebody out there means business. As for the review, awesome as always. Shame the movie went with the ol' jungle slog instead of just balls out action. Dudikoff rules, either way. Urgh, yeah. I got this on a Double Bill VHS with Platoon Leader. Both films were pretty lacklustre. This was particularly dull. Always a bit disappointed that Dudikoff peaked so early with American Ninja 1&2 and Avenging Force. Are there any other good Dudikoff movies? M. Brown: Thanks! Gotta love Vaughn and his Mark E. Salamone ads...always produces a laugh. Dudikoff rocks. This should've been better. Jack: Good question. Chain Of Command and Cyberjack are solid films...avoid Musketeers Forever. And I am one of these "Dudikoff-Competits". Cheers Ty. Yeah, now I think about it I think I've seen Cyberjack too. It's like a futuristic Die Hard. Yeah, that was pretty fun. Will check out Chain of Command. Harry: That's great you're a super Dudikoff fan. He's good as usual, but the movie is weak. Jack: Agreed. Good point...it was a futuristic version of DH! Looking forward to your take on Chain Of Command. Roger: The Finnish website you linked is very interesting. We are posting Human Shield soon. I too am quite a fan of The Dude. I recommend Crash Dive, but I may be in the minority. 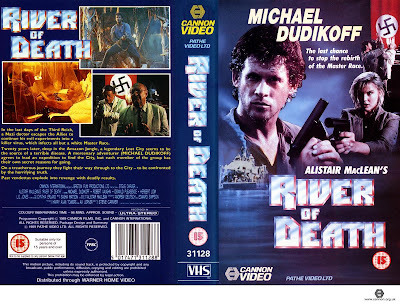 Quite frankly, if you prepare yourself for a B-level "Die Hard in a Submarine", you'll be OK.
As much as I like Dudikoff, River of Death was almost unwatchable. 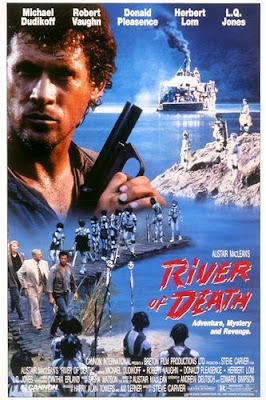 River Of Death was a tough sit...thankfully Dudikoff was in this. Will have to check out Crash Dive one of these days. Thanks for the recommendation! 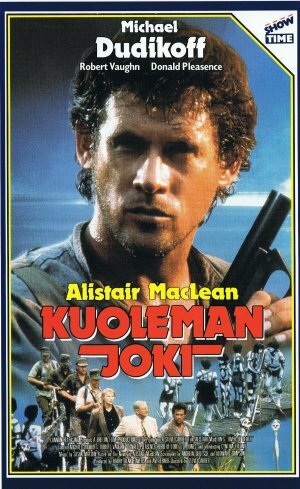 I enjoyed Firewalker but did not really care for this one, one of Dudikoff's weakest films for me. Definitely agree...one of his weakest...Midnight Ride was also a disappointment.